apologies to the silber crew and of course Dyr Faser whose 5 in 5 outing we omitted – well overlooked its fair to say during the course of our scribblings on the latest batch of Silber outings. Five delicious post punk sore thumbs from a minimalist electro past c 1980 – in truth perfect for all you old school Mute, factory, fast records et al admirers and something that should equally appeal to those subscribing to the likes of the Weird and polytechnic youth imprints. Reference wise these five chill toned nuggets head out from beneath the shadow of the normal and fad gadget, the latter mentioned irrefutably so on the opening strike ‘just a face’ while both ‘until then you’ and ‘to be desired’ come possessed of an Edward Ka-Spell-esque grooving of shadowlined soft psych distortions. Best moment of the set though comes with the starkly sparse approach of ‘take the one’ which annoyingly tapers off just as its about to blossom though not before giving hints that its author is something of a Cheval Sombre fan. 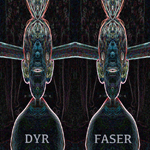 Dyr Faser manage to cover all manner of soundscapes and vibes in this 5 minute EP with a massive array of curious and confronting sounds that will take you on a deep dark cave-live journey. There are elements of post-punk, electronic, industrial, and psyceldelica mixed together here, all working together to create a thick atmosphere. ‘Just a face’ is a chilling electro/punk offering. Full of thick atmosphere and a curious eastern twist it paves the way towards a deep dark journey. ‘Until then you’ lifts the energy. Sounding somewhere between Nine Inch Nails and early Cure there is a confronting and menacing feel felt throughout. ‘To be desired’ brings in a cool if not creepy psychedelic vibe into the sound creating an airy haze. ‘Only the dark’ sees some no wave / shoe-gazer elements creep in courtesy of a slow and hypnotic guitar that lulls you into submission before leaving you behind. The EP closes in a slightly chilled out fashion with the slow ‘Take the one’ that soon unravels into oblivion.